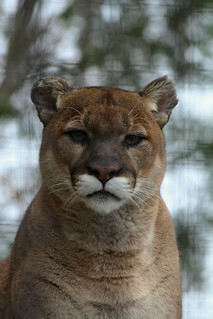 This cougar spoke volumes to me when I photographed her. I was not pleased I will admit to see how small her enclosure was. My support of zoo's wanes a lot. I know some zoo's do some good for endangered species. But there are some who are not great. This cougar when I saw her just sat perched staring into space no matter how many times I went to see her. Her eyes speak volumes to me.